Something terrifying happened! 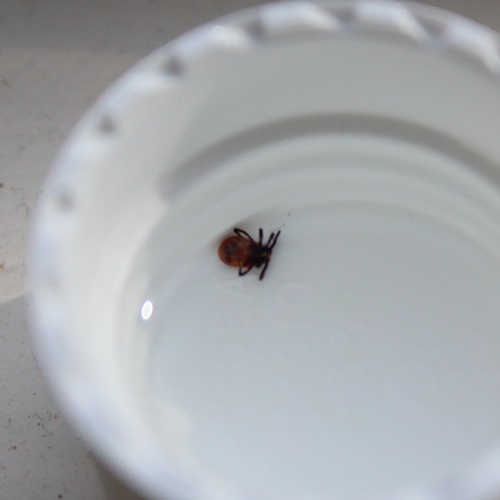 My husband was helping his uncle put away wood in their basement and found a deer tick on him. He showed it to me and flushed it down the toilet. The next morning he found that he missed another deer tick that had overnight lodged itself into his skin. What followed was horrifying. My husband had to pull the tick off him with tweezers, taking care not to leave any tick parts in his skin. After he pulled it out, we drowned it in a little bottle cap of vodka. I’m glad he noticed the tick on his body right away. The less amount of time a tick is lodged into one’s skin, the less likely to develop lyme disease. The usual course of action if one suspects lyme disease is to go through several rounds of antibiotics. A woman who has been living with lyme disease for over a decade told me that she had a few rounds of antibiotics after she got bitten by a tick, and that she stopped taking antibiotics as soon as her lyme disease symptoms ended, only to have relapses many years later. She said in retrospect she should have continued on the antibiotics well past when her symptoms ended. Karen Allen, actress well known for her appearance on the movie Indiana Jones, talked about her bout with lyme disease and how she found relief in the Hulda Clark Zapper. Another reason to feel lucky that we have the Hulda Clark Zapper in our home. Every home should have one! Here’s Jay’s Countdown to 50 this month, in which he talks about using the Hulda Clark Zapper after he pulled the deer tick off his skin.